Activists attempted to block the Serene Sea, a vessel loaded with crude oil from a Kinder Morgan terminal. Activists set up to form an aerial bridge blockade in the path of Trans Mountain oil tanker traffic on July 3, 2018. The activists suspended from the Ironworkers Memorial Bridge in Vancouver. VANCOUVER — Greenpeace Canada says a protest that saw a dozen protesters dangling from a Vancouver bridge to block a tanker carrying crude oil from the Trans Mountain pipeline ended Wednesday night. The environmental group says the climbers who spent more than 35 hours on the Ironworkers Memorial Bridge were "peacefully removed from their positions" and taken to the North Vancouver RCMP detachment. The RCMP had earlier said all would likely be charged with mischief and jeopardizing the safety of a vessel. North Vancouver RCMP Cpl. Richard De Jong said an aerial extraction team began removing and arresting the protesters in the afternoon in what he called a methodic and safe operation. The protest began Tuesday morning when activists rappelled off the side of the bridge to block the Serene Sea, a vessel loaded with crude oil that had left from Kinder Morgan Canada's Westridge Marine Terminal. The protest was focused only on the Serene Sea but authorities responded by closing all tanker traffic in the area, said Jesse Firempong, a Greenpeace spokeswoman. 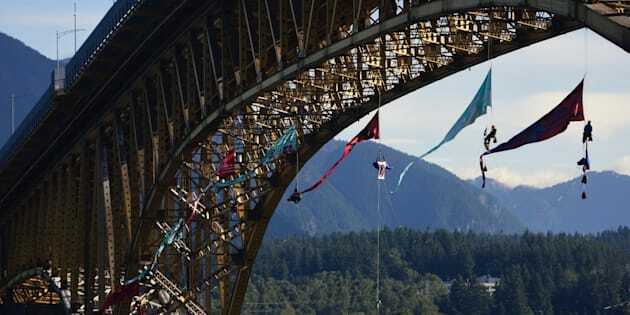 Deep-sea vessels and vessels with a high air draft, including sail boats with a high mast, were unable to safely pass under the bridge due to the location of the protesters, banners and connecting lines, said Danielle Jang, a spokeswoman with the Vancouver Fraser Port Authority. Smaller traffic such as tugs, barges and small commercial vessels were still able to transit under the bridge, she said. Will George was among those arrested on Wednesday after occupying the bridge for more than 35 hours, said Kwekwecnewtxw — Protect The Inlet, a group formed to oppose the Trans Mountain expansion. "I will remain the fierce opposition. It is in my blood to protect the water. Our Indigenous rights are being completely ignored, the safety of our water is being ignored, and most of all, my son's future is at stake," said George, the group's spokesman and leader. "I will do whatever it takes to protect the water and my family and your family." A Coast Guard hovercraft and boat standby as a protester opposed to the Kinder Morgan Trans Mountain pipeline expansion is lowered to a police boat after spending two days suspended from a bridge in Vancouver, on July 4, 2018. Trans Mountain, a subsidiary of Kinder Morgan Canada, said it respects the right to peacefully demonstrate and there are many ways to express opinions in a safe and legal manner. "It is unfortunate that the actions of these individuals have caused disruptions to vessels and individuals that transit to and from the waters east of the Ironworkers Memorial Bridge, including customers from our terminal and the other marine cargo terminals," it said in a statement. Earlier Wednesday, Premier John Horgan said he was concerned that authorities had closed a rail bridge in response to the protest, resulting in the blockage of a different tanker loaded with refined fuel destined for Vancouver Island. "The protesters, as long as they're abiding by the law, that's their right in a free society. But when they start to impact on the business of other people when they start to infringe on the laws of the land, then there's a concern," he said. "At this point, as I understand it, it's a question of the rail bridge is down and that's the problem." The Canadian government's $4.5-billion deal to buy the Trans Mountain pipeline and expansion project is expected to close later this summer. On Tuesday, the company released its construction schedule for the next six months, with work planned in the Lower Mainland and North Thompson areas of B.C., as well as between Edmonton and Jasper National Park in Alberta. Greenpeace said the protesters are from the Coast Salish community, B.C., Alberta, Quebec, Ontario, Washington state, Mexico and the United Kingdom.